9/19/2009 - WASHINGTON (AFNS) -- The secretaries of Defense and the Air Force joined the Air Force chief of staff, chief master sergeant of the Air Force, and distinguished guests from all services at a Pentagon dedication ceremony for the Airman's Hall in which the service attached six new streamers to the Air Force flag Sept. 17. The event was held to coincide -- or at least be close to -- the Air Force's 62nd birthday Sept. 18. "As we award our campaign streamers and celebrate the 62nd birthday of the United States Air Force, note that we honor this hall best by working hard to keep our promises to our greatest assets: the heroes sitting in the front row, the Airmen serving around the world today, and their families who serve with them," said Secretary of the Air Force Michael B. Donley. The heroes sitting in the front row were three Air Force wounded warriors, special guests for the event invited to attach the campaign streamers to the flag -- Lt. Col. Greg Harbin, a forward air controller and member of the special operations remote operated video enhanced receiver program; Tech. Sgt. Michael Williams, an explosive ordnance disposal specialist, and his wife and son; and Staff Sgt. David Flowers, an EOD journeyman, and his wife. "Today you get to put the streamers that you earned on the Air Force flag," Gen. Norton Schwartz said to them. "And to the spouses, you know that this is a team sport. You know that better than anyone. We are grateful for your service and sacrifice as well." Colonel Harbin and the two sergeants attached the campaign streamers to the Air Force flag. Colonel Harbin attached the Iraq Campaign streamers, Sergeant Williams the Global War on Terrorism Expeditionary Campaign streamer and Sergeant Flowers attached the Afghanistan Campaign streamers. "What a beautiful ceremony," said Sergeant Flowers, who along with Sergeant Williams is recovering from injuries sustained during duty in Afghanistan. "I really appreciate getting to do this, helping the Air Force continue their warrior tradition." The Airman's Hall, located on the fourth floor at the apex of corridors 9 and 10 in the Pentagon, features multimedia presentations of Air Force leaders, Air Force Medal of Honor recipients and the Outstanding Airmen Display. "Walking through this hall, my thoughts quickly turn to the thousands of Airmen who have answered our nation's call, fighting alongside our joint and coalition partners. And most importantly, those who have given their lives in defense of freedom," Chief Master Sgt. of the Air Force James A. Roy said. "Their stories remind us of our responsibilities as warriors, described so well in the Airman's Creed: a tradition of honor, and a legacy of valor." 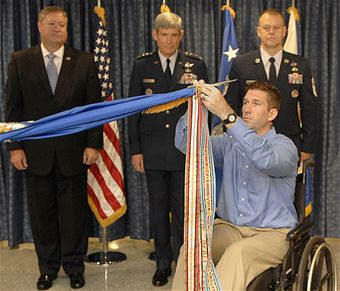 Battle or campaign streamers awarded to Air Force units are equivalent to combat service medals for individuals. The Air Force earned streamers for the Afghanistan Campaign, Iraq Campaign and Global War on Terrorism Expeditionary Campaign. The Afghanistan Campaign streamers are awarded under criteria established for the Afghanistan Campaign Medal. The streamer has 13 stripes representing the colors of the new Afghanistan flag; and red, white and blue to represent the Unites States and its allies. The streamers represent completion of two campaigns: the liberation of Afghanistan (Sept. 11 through Nov. 30, 2001) and Consolidation One (Dec. 1, 2001 through Sept. 30, 2006). The Iraq Campaign streamers are awarded under criteria established for the Iraq Campaign Medal. The streamer has 11 stripes. Green is the traditional color of Islam; red honors the fighting courage for the pursuit of freedom; white denotes generosity; and black exemplifies Islam's success. The streamers represent completion of three campaigns: the liberation of Iraq (March 19 through May 1, 2003); the transition of Iraq (May 2, 2003 through June 28, 2004); and Iraqi governance (June 29, 2004 through Dec. 15, 2005). The Global War on Terrorism Expeditionary Campaign streamer is awarded in recognition of service in other Global War on Terrorism geographic regions outside of Iraq and Afghanistan, such as Bahrain, Qatar, and the Horn of Africa. The streamer has 15 stripes and the inscription, in yellow, "Global War on Terrorism."